2001 2002 2003 2004-2007 2008-2009 2010 2011 2012 2013 2014 2015 2016 2017 2018 NOTE:The informaion on this page is extremely old. Although this can technically still be done today, there are much better solutions now days. This page is kept for reference only. $100 is probably a a high water mark. Buying in bulk or shop around for deals can really lower the price. Also, SSRs can be built a lot cheaper than they can be purchased, but that requires some knowledge of integrated circuits; something this how-to is trying to avoid. Standard disclaimer: I'm not responsible for anyone hooking these circuits up and the results that follow their use. Here is the end wiring result. 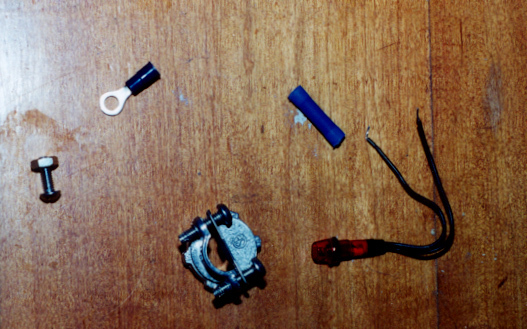 Pins 2-9 are the control (positive) wires going to the box., while pins 18-25 can all be used for grounding. 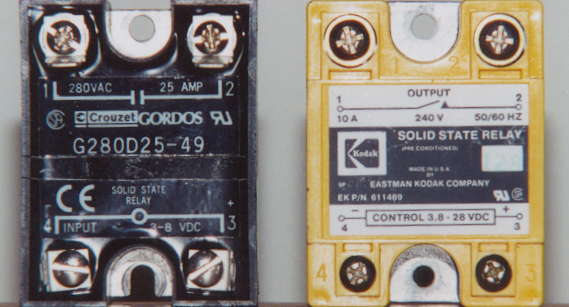 Solid State Relays (SSRs) are the heart of Parallel Port Control Boxes. I find it easier to purchase pre-built SSRs, but you can build them (rather cheaply) if you know what your doing. Drew Hickman provides some good information on his Christmas site for building SSRs. If you shop around, you can usually find used 110V 10A SSRs that will work with 5 vdc input for under $5 a piece (sometimes $3). You'll need an electrical box or two (I recommand metal) to hold your outlets. If you look at the way the outlets are wired, you notice that the NEUTRAL (right side) of each outlet is connected together. 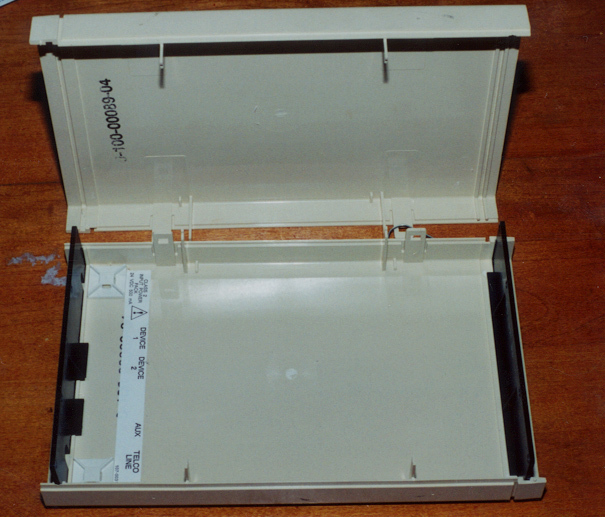 For the NEUTRAL side, it is important that the tabs between the top and bottom outlet are not broken, but since we want each outlet to be controlled individually, the tab on the hot (left side) is broken. 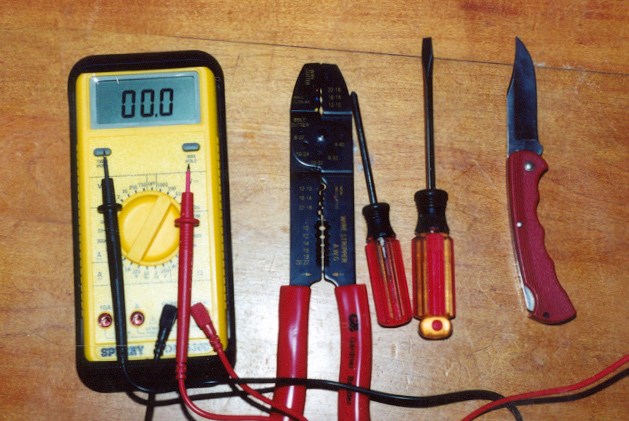 The wire is very flexible and much easier to work with than 14-3 solid wire. 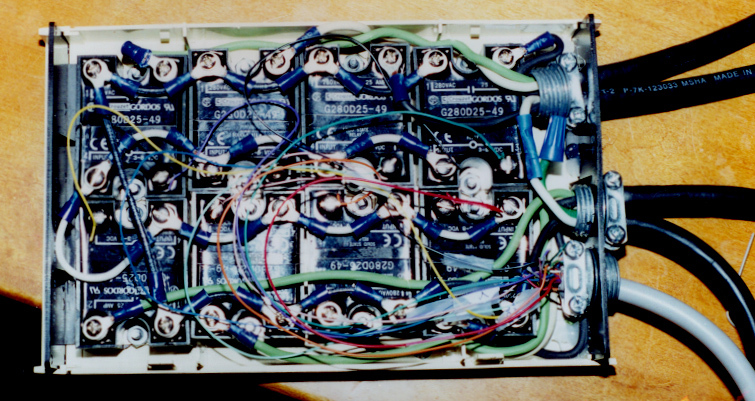 Each wire (Back, White, and Green) is covered. 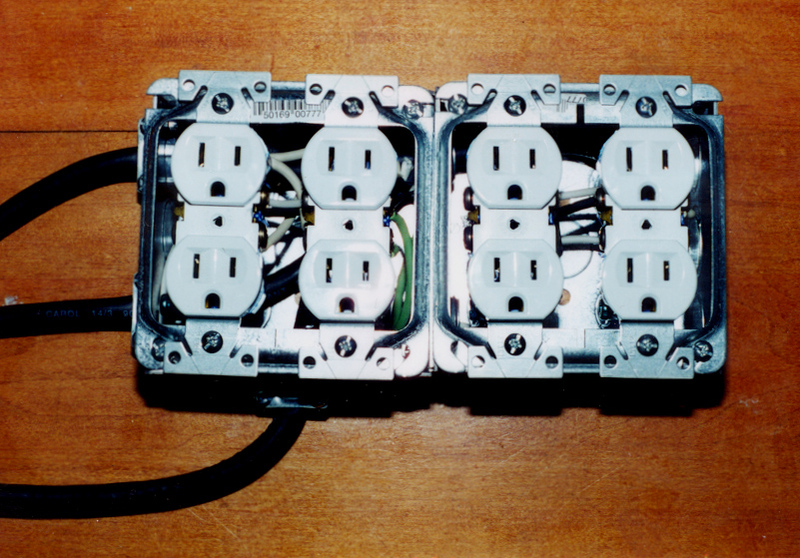 Bringing in 3 sets of coated wire provides 9 individual wires which is exactly what is needed to control 8 outlets (8 hot wires and one common ground). Note: The picture of the wiring can be really confusing because I'm using Green wires as HOT and the white wires can either be HOT or NEUTRAL. 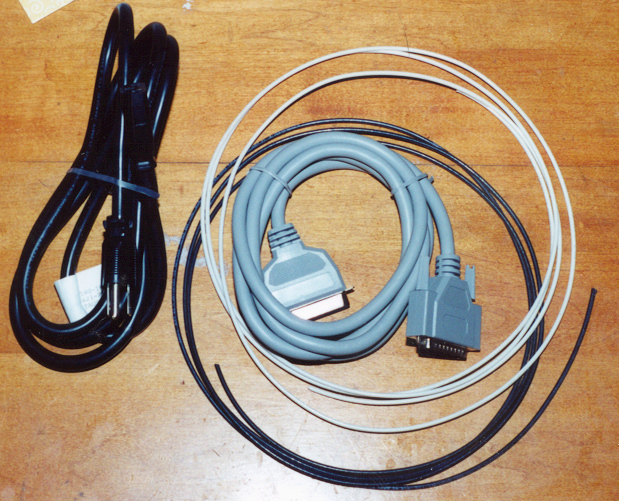 When doing odd things like this, the correct way to denote these changes is to Mark any HOT Green and White wires with back electrical tape. I didn't have any tape near by when I did the wiring, so I skipped that step. Note: It would have been nice if 10 wires could have been easily brought in so that a common ground wire could have been used to ground the entire box. This can be accomplished by having the 110V pig tail that brings the AC current from your house, go directly into the boxes that hold the outlets rather than into the box that holds the relays. 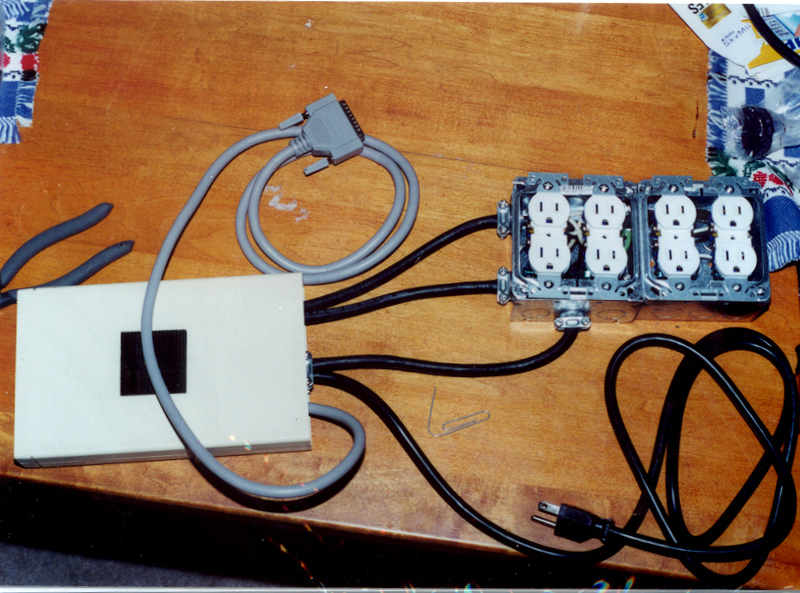 If wired this way, the ground and NEUTRAL wires from the pig tail can be connect to one of the outlets and then the hot (black) wire could be sent up to the relay box though on of the nine wires that connect the outlets to the relay box. 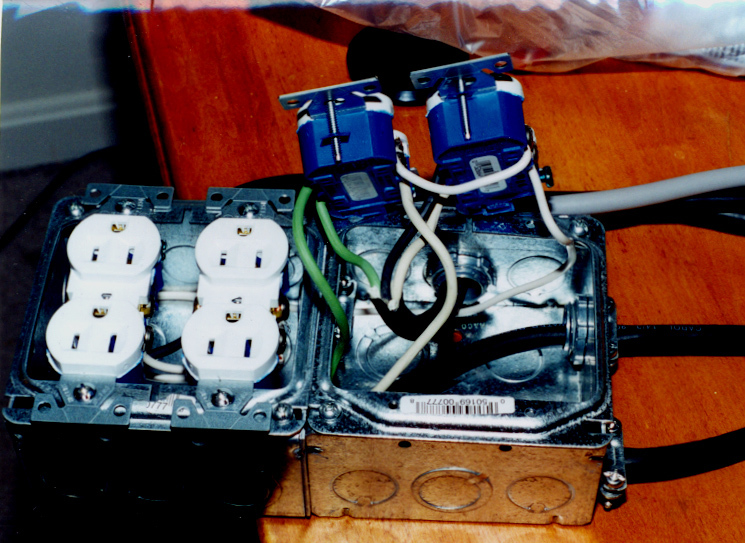 In that case, 8 of the 9 wires could carry the individual hot circuits down to the outlets, and the other wire would care the common hot circuit up to the relay box. 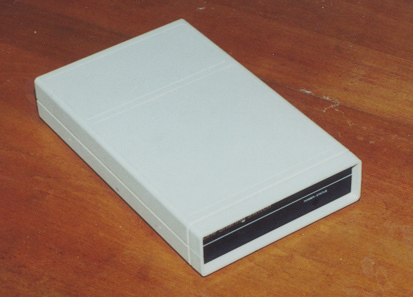 Unfortunately, I build my demo box before thinking of this solution. 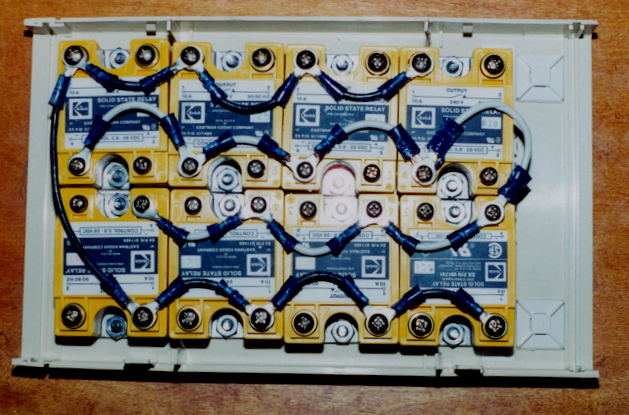 The incoming terminals of 110V AC sides can all be wired together too (black wire). This way 110V is available at each SSR, ready to be switch on. If you are not interested in rolling your own software, check out Vixen. The Basic Parallel plug-in works just fine with this design. out 888, A 'Reset lights.